In this paper I will provide a new argument for post-syntactic morphology. The empirical evidence comes from so-called displaced morphology in German verb clusters, where the non-finite verb form selected by a given governor does not appear on the immediately dependent verb but rather on the linearly last verb of the selector’s complement. The placement of the morphology thus partly depends on linear notions and not exclusively on hierarchical relations. I will provide an analysis within Distributed Morphology (Halle and Marantz in The view from Building 20. Essays in linguistics in honour of Sylvain Bromberger, MIT Press, Cambridge, MA, pp 111–176, 1993), where exponents for non-finite morphology are inserted into separate functional heads which are linearized after their VP-complements. At a late stage of the PF-derivation, the exponents are associated with their verbal hosts by means of Local Dislocation, an operation that applies under adjacency (Embick and Noyer in Linguist Inq 32(4):555–595, 2001). As a consequence, the non-finite morphology always comes last in the selector’s complement. Displacement arises once the immediately dependent verb is not the last verbal element in the complement of its selector; this is generally the case in strictly ascending orders, while in the strictly descending 321 order the morphology is faithfully realized. The placement operation is thus always the same, displacement only emerges as a side effect of certain cluster orders. Further evidence for a post-syntactic approach to the placement of non-finite morphology and against a pre-syntactic perspective comes from the absence of semantic effects under displacement, the emergence of non-finite verb forms specified for more than one non-finite category under multiple displacement and the distribution of default forms. Salzmann, Martin. 2019. On the limits of variation in Continental West-Germanic verb clusters. Evidence from VP-stranding, extraposition and displaced morphology for the existence of clusters with 213 order. 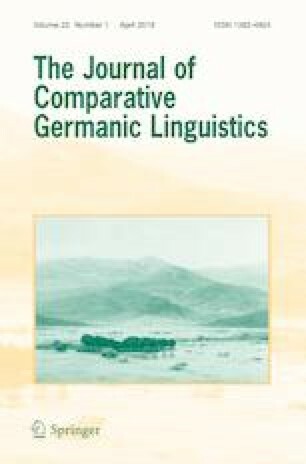 Journal of Comparative Germanic Linguistics 22 (1): 55–108. https://doi.org/10.1007/s10828-019-09104-x.